Are you wondering how to improve your images in a simple and quick way? 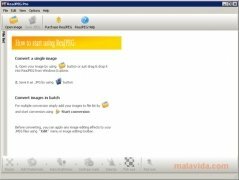 Try ReaJPEG, an image editor and converter with support for batch processing, with which you will be able make your favorite adjustments to a great quantity of photographs in a practically automatic way and in a matter of minutes. - Friendly and very easy to use interface. - Practical batch image editing. 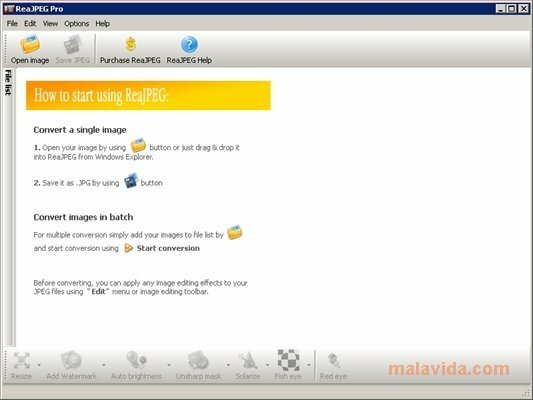 - Efficient batch converter, that will allow you to convert any file to JPEG. - Possibility to use the practical command line for the image processing. - Includes the typical adjustments like crop, change size, modify colors, elimination of red eyes, add watermarks, etc. - Possibility to apply artistic effects. - Support for more than 65 kind of image formats, among which we will find RAW, BMP, ICO, GIF, PIC, PCX, PPM, JPEG, TGA,HDR, etc. To make small basic retouches to your images in a quick way, download ReaJPEG. The trial period is limited to 30 days.